How To SUPER CLEAN Your Car Windshield! - Muscle Cars Zone! How To SUPER CLEAN Your Car Windshield! In this one, Chris Fix is showing us how to clean the car windshield using one very practical method. He demonstrates this method on his 1996 Chevrolet Corvette. After the paint, the glass is the second largest surface found on a car. Having said, having clean windshield and windows is a must for your car to look good especially if you participate in car shows. This is very important considering that you almost always look through the windshield when driving your car. Besides looking very bad, having dirt on your windshield can distract you from driving. It`s also super annoying and it can strain your eyes. With this one, you`ll make sure that your windshield will be able to bead up any water and prevent ice and bugs from sticking. By using this method of car windshield cleaning, you`ll minimize any reflection at night as well. There is a huge variety of glass cleaners that can be found on the market. So, pick your favorite glass cleaner but make sure it doesn`t contain many harsh chemicals like ammonia. To clean your windshield, instead of using piece of newspaper or a paper towel, use a microfiber towel instead. By using a microfiber tower, you would not scratch the glass and it absorbs water very efficiently as well. This towel also leaves no fuzz and residue. Having said this, the first step of this tutorial is of course to clean your windshield thoroughly using your microfiber tower and your glass cleaner. Watch the entire tutorial in the video below. 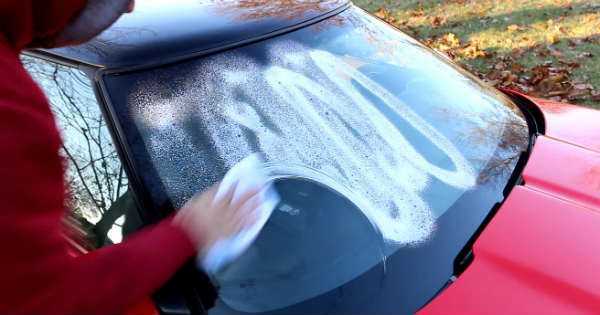 Finally, follow this link to learn how to defog your windshield in the morning quickly and effectively!